Born and educated in Yorkshire and London, England, Alison Jardine arrived with her family in Texas in 2003, where she established herself as a professional artist. Jardine's work has been included in numerous local and national juried competitions, and is in collections worldwide. Alison Jardine enjoys writing, and has contributed to arts publications, as well as worked as an art instructor in public schools. 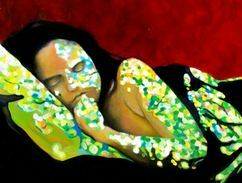 PixelNation grew from my interest in merging traditional oil painting with digital technology. So many of our memories and so much of our lives are stored, shared and created on the web and digital media that I began to explore the idea that the method of creating the work becomes secondary when the resulting work is translated into a digital image, a collection of pixels that can be turned off, or activated. Is this image of a painting a new work, or just a copy? Since 2009, I have used the motif of the pixel, representing a core fragment of new culture, to make traditional paintings through the lens of my digital-age aesthetic: back-lit colors and graphical interfaces. My paintings are a new kind of landscape painting; nature, particularly ‘light’ as concept and as a physical phenomenon, is a repeating theme in all my work. This is rooted in the ancient forests and trees of Yorkshire where I was born, and the wide-open wilderness of the Moors, whose stories and dramas forged my visual and artistic identity as I grew. My process begins with location-based photographs and sketches, or photographs from my own family and past, that I then digitally manipulate and collage. These images might form the basis for a painting or monotype, or be realized as a digital artwork. In my present series, after I have completed an oil painting, I photograph it and digitally manipulate the resulting image. This in turn forms the basis of a new oil painting, and the cycle repeats. I recently completed a 365-day iPad drawing project, in which I created an unthemed, diaristic iPad drawing each day that I shared on social media. The works existed both for social media and because of it, stored on hundreds of thousands of individual computers when viewed. The social media environment is challenging the notion of an ‘original’ work ~ although I have nominal ownership of the artwork, nothing but the restraint of the viewer prevents them from keeping a copy ~ or it is the original? ~ on their computer. This project has allowed me to explore the idea of social art as a non-owned object, in which ubiquity has replaced originality as the valuable commodity. I can place this art wherever I want to in our virtual world, and I have no control over what happens to it, or how many times it is reproduced or altered. In fact, endless reproduction becomes a desirable aim. Any artist’s work reflects their own environment, and mine exists exactly where I do: within nature, and within digital media, and both these worlds are made of light, the unifying motif of my artworks. K Space Contemporary (Corpus Christi, TX) ~ Third Coast National ~ Juror: Trenton Doyle Hancock. Bath House Cultural Center (White Rock Lake, Dallas, TX) ~ Día de los Muertos ~ Juried show. Juried by Bath House Curator Enrique Fernández Cervantes. Affordable Art Fair, Manhattan, New York. Presented by ugallery.com. Judged the Art of Santa Monica (Elan) competition in Santa Monica, CA, USA. Pearl @ Commerce in Dallas ~ Group show: “Art & Toys” an invitational one-day art & music event at the , featuring 12 local artists.